The first Presidential debate between Democratic candidate Hillary Clinton and Republican candidate Donald Trump takes place tonight at Hofstra University in New York at 6:00pm PDT/9:00pm EDT. PlanetPOV is hosting a live chat during tonight’s debate that 9 out of 10 mental health experts recommend (as opposed to watching the debate alone and throwing a remote through your tv screen). An insightful, witty and refreshingly sane conversation is on tap! It begins at 5:30pm PDT/8:30pm EDT and continues through the entire debate. All are invited to join in, members can login to chat live about the debate as it happens and guests can read along without having to login. You can join the chat or read along by clicking on the “Live Events” floating bar in the bottom right hand corner of your screen (if you only see a small button there, click on it to sign in then click the Live Events bar). We are also live streaming the debate below so feel free to open one window with the live stream and another window with the Live Event chat to watch and chat simultaneously. This is expected to be not only the most watched debate in history but one of the most watched live events in tv history. 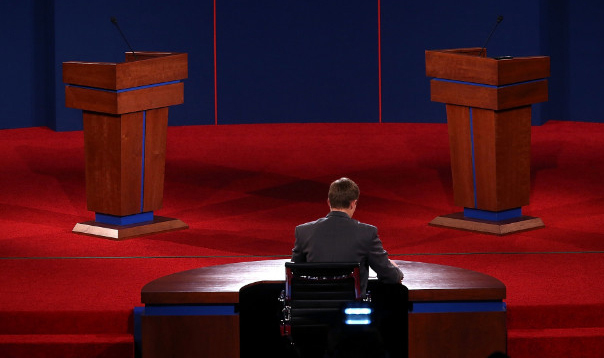 There is no better way on The Planet to experience this historic debate than right here at PlanetPOV with our live chat and live streaming of the debate! Will this live stream the debate? I cannot watch it on my tv because I might break the tv throwing a shoe at it, much safer to watch on my pc. Hey Beetch! How ya been? Tonight is going to be fun. (I hope) Glad you’ll be participating. Fantastic! Yes, been way too long! Wow, hope the weather calms down a bit and the repairmen get the job done soon! Neither rain nor sleet nor shorting out of internet service is allowed to keep you from our chat tonight! Hey, wanna take bets on how many minutes into the debate before Trump drops the “presidential posture,” and resorts back to his orangutan nature? My apologies to all orangutans. I’d give it around 30 minutes or so. And just for the record, orangutan’s have much more Presidential demeanors than Trump. I think maybe you’re being a bit generous, but maybe you’re right. One never really knows for sure when it comes to the yammering circus peanut. I think he will definitely start as “presidential,” as far as that’s possible for this reality TV star and master con man. At any rate, be sure to bow down to him as Omarosa has commanded.